Interstate 64 is locally known as the Riverside Expressway, and runs along the Ohio River east and west through the city. East of downtown, the road turns more into Kentucky and leaves the Louisville metro area to the east. The Riverside Expressway began in 1955 when it was proposed that the existing riverfront road be widened. In 1957 the plan upgraded the new road to a freeway, and public hearings began in April of 1961. There were no detractors at the public meetings, and public opinion was very pro-freeway. Construction began from the Shawnee Expressway to 3rd St in 1963, and from 3rd St to Zorn in 1965. Both sections were open by late 1967. 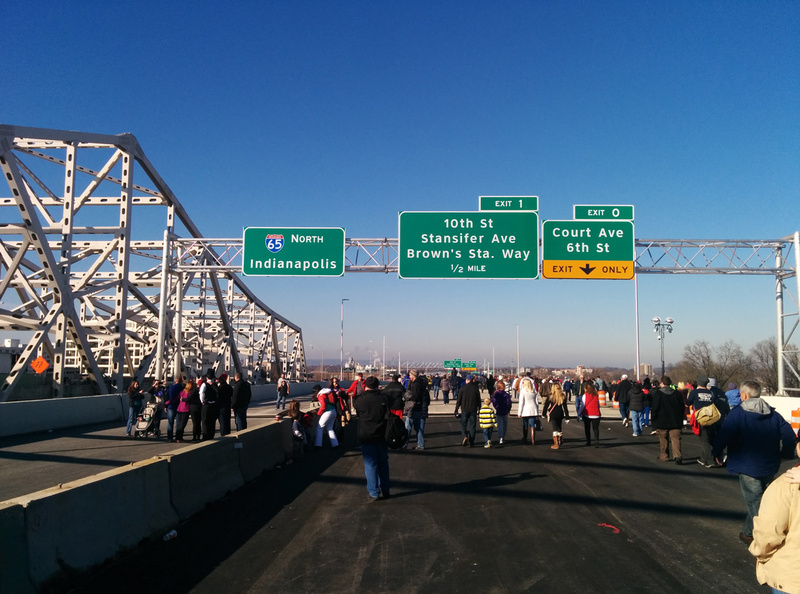 The expressway is widely blamed for turning downtown Louisville against the river, and forming a symbolic barrier. Most downtown development began to drift south down 4th Street instead of towards the river, which was at that time covered with railroad tracks and dirty warehouses. The first removal idea was touted in a 1999 study, but was abandoned because of expected traffic congestion. The “8664” idea, to remove the Riverside Expressway, gained traction when proposals surfaced in 2002 to add an Ohio River bridge to ease congestion in the city, and widen I-64. A landmark on the freeway east of downtown is the Cochran Hill Tunnel. The tunnel opened in 1970 and carries the road under Cherokee Park. The state gave the tunnel a historic landmark designation in 2007. This inhibits plans to widen the expressway, which is only two lanes wide in the area and frequently experiences traffic backups. Interstate 65 runs from the Ohio River south through Louisville to the Watterson Expressway. South of the Watterson Expressway, the road is the old Kentucky Turnpike. The turnpike opened August 1, 1956 and connected the city with Elizabethtown to the south. Tolls were removed in the summer of 1975 and the road became free along with the interstate through town. In the summer of 2007, the freeway was renamed after Martin Luther King for its stint through Jefferson County. 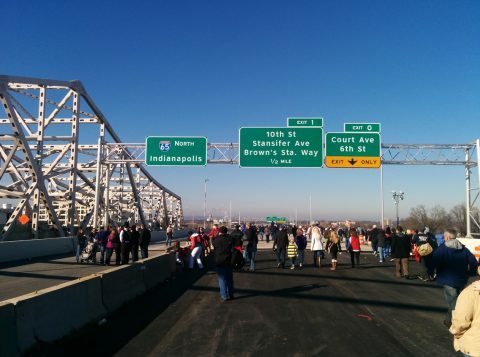 The new Abraham Lincoln Bridge opened to traffic on December 6, 2015 as the second crossing for I-65 over the Ohio River. The span will carry northbound traffic once the adjacent John F. Kennedy Memorial Bridge is reconstructed for southbound traffic. 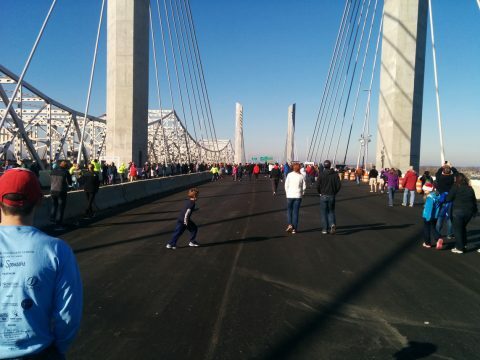 A public walk was held for the Abraham Lincoln Bridge prior to the opening for vehicular traffic. This view looks north by the south tower of the cable stayed bridge. Photo taken by Matt Slater (December 5, 2015). Clearview font based guide signs posted near the north end of the Abraham Lincoln Bridge for the first two Jeffersonville, Indiana exits of I-65. Photo taken by Matt Slater (December 5, 2015). The Shawnee Expressway is the local name for I-264 west of US 31W. It runs north/south through the west side of the city. The expressway was named because it runs directly through the Shawnee neighborhood of Louisville, and near Shawnee Park. The 8-mile freeway opened in 1970, and for its first 22 years it received no more than emergency repairs or patching. 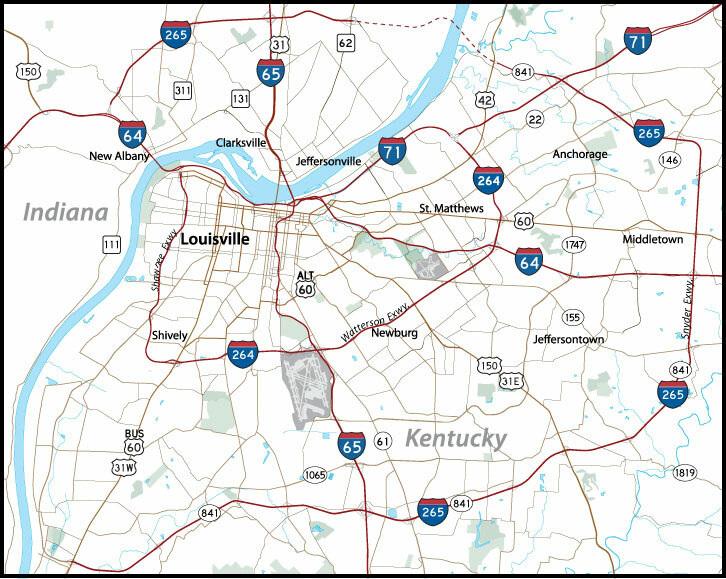 The freeway runs through poorer areas of Louisville with high minority populations. Complaints were leveled at the state which insinuated that the road was not upgraded because it ran through a poorer part of the city, while almost every other expressway in town was rebuilt. In March 2003, a $66 million renovation began which involved adding lanes, rebuilding all of the concrete, and rebuilding or replacing 37 bridges. The rebuild connected with the newly rebuilt portion of the Watterson Expressway east of Dixie Highway, which was completed in 1995. The rebuilt expressway opened in August 2004. Currently, the expressway sees about 110,000 vehicles daily. The Henry Watterson Expressway is the local name for I-264 from the Dixie Highway on the southwest side of town and around the city to the south and east to I-71 on the northeast side of town. The road was named for Henry Watterson, a journalist and later the editor of the local newspaper. The road is the oldest expressway in the city, and began with a 1941 planning document describing the need for a bypass around the southern end of the city. World War 2 delayed the opening, but in 1948 the expressway opened from the Dixie Highway to the Shelbyville Road on the southeast side of the city. It was advanced for its day, and engineers from cities like Dallas and Seattle came to see the road. Industry soon moved out to meet the road, the GE plant opened in 1953 and Ford Motor moved its local plant out in 1955. Suburbs moved out to meet the Watterson, too, and during the mid 50s over 500 new subdivisions opened along the route. In 1974, the Watterson Expressway was extended northward to near the river and I-71. By that time, the older portion of the road was already very outdated. Work began in 1984 for a $100 million rebuild of the expressway. The roadwork realigned almost every interchange and widened the road. Reconstruction was complete in 1995. I-265, the Gene Snyder Expressway, is an outer freeway loop of Louisville. Originally called the Jefferson Freeway, the road was named after US Representative Gene Snyder in 1982, after he secured the $52 million needed to complete the freeway. The road is entirely cosigned with KY 841, which goes beyond the limits of the Interstate section to further complete the beltway. The Kentucky portion of the road cost more than $300 million to built and opened in 1987. I-265 also has a section in Indiana that is not connected to Kentucky, and opened in 1977. The two sides will be connected with completion of the East End Bridge. Construction on the cabled stayed bridge started in mid-2013 and finishes by the end of 2016. Page Updated September 22, 2016.